So why do many business leaders see workplace conflict as only an inconvenience? Is it possible to shift the narrative, and make your conflict resolution process a competitive advantage? There's a reason why workplace conflict tends to be viewed in a negative light. Some differences between team members can appear to be insurmountable, and tension, stress, and emotions often accompany even minor conflicts. Workplace conflicts can feel too overwhelming to manage. And there’s a good chance you don’t have a solid process in place to handle them. Fortunately, there are steps you can take to ensure that workplace conflicts are properly addressed and don’t slow your organization’s growth. In this article, I’ll walk you through how to identify conflict, and introduce you to a simple and proven process to rectify them. If you’d like to use these strategies in your workplace, start by downloading our Conflict Resolution Template below. To resolve workplace conflict, it’s important to know how to identify it in the first place. Below are some early warning signs that there could be conflicts occurring within your workplace. It should be noted that none of these are 100% surefire signals that workplace conflict exists, and that you should use your own judgement to assess situations. Disagreement patterns – Are there employees who always seem to disagree with one another, no matter the topic of discussion? Some level of disagreement and challenging others is a positive attribute of a healthy workplace. But if the challenges seem personal or vengeful, this can be a sign that there’s conflict beneath the surface worth addressing. Low employee retention ­– High employee turnover is always a sign that something’s wrong. Do certain teams have especially high attrition rates? Work environments fraught with conflict and in-fighting have a tremendously negative impact on morale and employee satisfaction. If managers are not actively resolving these issues, employees are much more likely to leave the organization. Gripe-filled meetings – Meetings should be productive, engaging sessions where work gets done and decisions are made. If you notice that meetings or group conversations turn into “venting sessions,” it’s likely that workplace conflict is having a negative impact on productivity. Declining job performance – Are team members failing to work collaboratively or has productivity or quality dipped? While a variety of factors can influence team job performance, unresolved conflicts are one source of worsening team productivity. 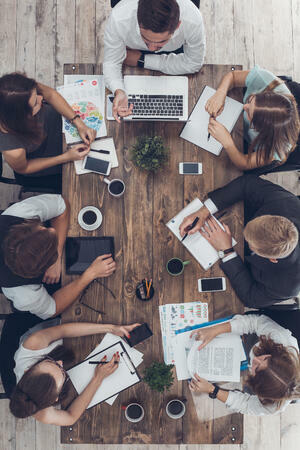 Communication silos ­­– Have you noticed “cliques” starting to form between groups of employees? Sometimes, lack of workplace communication and leadership enablement can result in these communication silos. Other times, underlying conflict can be the root cause of team members failing to work cohesively. Once you’ve confirmed that there’s an ongoing conflict, you’re ready to take steps to resolve it. Start by printing out the Conflict Resolution Template, and set some time aside to make sure that you’re going through the process deliberately. You should always begin by asking every party involved in the conflict to relay their perception of it to you in private. This allows you to form the big picture by viewing the workplace conflict through every participant’s eyes. Find a comfortable place to discuss the issue at hand and try to eliminate any indication that you are the one “in control” of the situation. Conflict discussions should feel natural to both parties, and choosing the right environment is a big part of that. As opposed to meeting in your office, consider booking a conference room or finding a place to sit privately outside. In the Conflict Resolution Template, take notes on what your employees communicate to you; both verbally and non-verbally. Keep in mind that your body language will have a huge impact on whether or not they are open and honest, and that you should manage your non verbals accordingly. The most important element during these discussions is to ensure that all parties feel heard and understood. You don’t want to do anything that puts somebody on the defensive. If you do, they will shift from being open and honest with you to avoiding accountability for their actions. Employ active listening skills and use body language that communicates openness. Possible root causes – identified by team member #2, #3, etc. In any discussion about a conflict, your ultimate goal is not to hear what the participants are telling you about the conflict, but rather to find out what the underlying cause really is. Most people are naturally averse to argumentative friction in the workplace, so any professional conflict is likely the result of a “straw that broke the camel’s back” scenario. Chances are that the inciting event often isn’t actually what caused the con­flict. Be on the lookout for underlying issues that may not be obvious at first. In your final assessment of the root-cause of the conflict, consider the observations of every party involved. Avoid being partial to the perspective of one employee and base your assessment on what you can objectively observe as opposed to how you feel about the situation. Finding a resolution to a workplace conflict can be complicated. Every conflict is different, but the same basic discussion process applies. Gather everyone involved and confer in a neutral and comfortable meeting environment. Ask each party what they would find personally acceptable as a resolution to the issue. 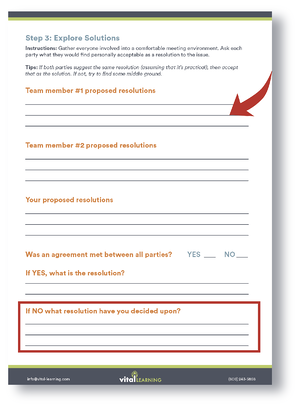 On page 3 of the Conflict Resolution Template, record the proposed resolutions of everyone involved. If both sides of the conflict say something similar, then your job is relatively easy. However, in most cases you’ll probably struggle to find the uniting factor between the two proposed resolutions. It is important not to validate each participant’s perception of the conflict, but simply to hear it and make sure the participant knows they’re being heard. The goal at this stage is to understand what each participant believes they need to resolve the issue — leave the worrying about how that relates to the root cause for the next step. Once you’ve heard their ideas on how to rectify the issue, it’s time to make a decision. 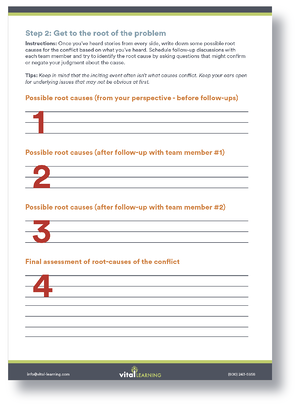 After you’ve met with team members, and considered perspectives on the source of the conflict, the root cause of the conflict, and possible resolutions, you should be able to determine the root cause that is actually generating the dispute. You can now begin negotiating a satisfactory solution with everybody. It can be helpful to picture the conflict as a Venn diagram. 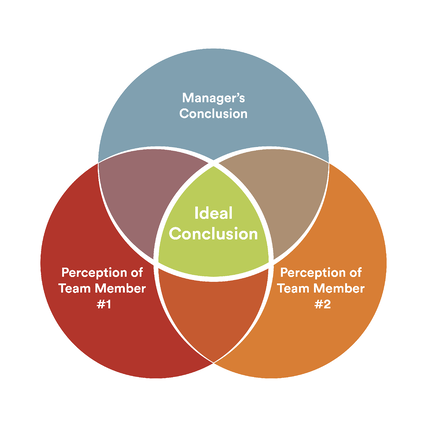 Your goal is to bring the three circles together, then find ways in which those three differing perceptions overlap at the center. Chances are that your solution lies in that overlap. Even if there is friction about the proposed solution, it’s vital that you arrive at one communally agreed-upon solution. It doesn’t have to be perfect. It simply needs to be as clear and objective as possible, and reasonably meet at least some portion of each participant’s desired outcome. Even if each party doesn’t feel completely satisfied, at least you’ve established a commonly agreed-upon foundation that you can use to neutralize the conflict and allow normal workplace behavior to resume. Once you’ve agreed upon a solution, you need to provide both parties with actionable steps. Don’t rely on them to leave the meeting completely changed — your goal is to modify and regulate behavior and action, not attitudes. Toward that end, each party must clearly understand what is expected of them going forward and how they’re expected to interact with each other from this point on. It’s important to check in with both parties several times during subsequent weeks. This allows you ensure that the agreed-upon solution and mitigating steps are being performed, and that each employee involved is satisfied with the results. If it appears that the solution is not effective or that the core issue is likely still unresolved, return to the “explore solutions” phase and try again. Passing judgement before considering perspectives – It’s easy to draw conclusions based on your initial impression of the situation. Problems arise, however, when your initial judgements get in the way of critical thinking once you’ve heard all sides of the conflict. Showing favoritism towards one version of events – This tip applies to more than just workplace conflict resolution. If you are “playing favorites” while dealing with issues between employees, you aren’t giving everyone a fair shot of achieving an equitable outcome. 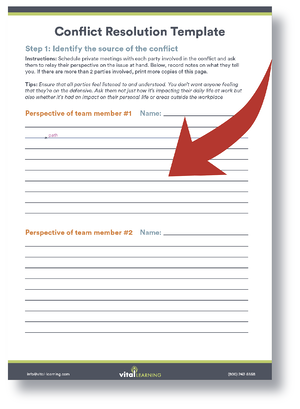 Leave your personal opinions of team members at the door. Letting the conversation stray away from the conflict at hand – There’s no doubt that it’s crucial to discuss all of the events surrounding the workplace conflict. What tends to happen in any emotion-based discussion, however, is that the conversation drifts to topics unrelated to what you’re there to settle. Try to keep things on-task, and relevant to the dispute being discussed. Allowing one team member to control the conversation – One root-cause of workplace conflict is that different personality types naturally clash. If one party is more outspoken and attempts to steer the meeting into a direction favorable to them, you should make an effort to get things back on track. Asking the quieter team member questions that help them communicate their side of the story is a great way to counter this. Let’s face it, there’s no such thing as a conflict-free workplace. However, there are ways to minimize the conflicts in your organization by ensuring that team members are equipped with tools they need to navigate tricky situations effectively. 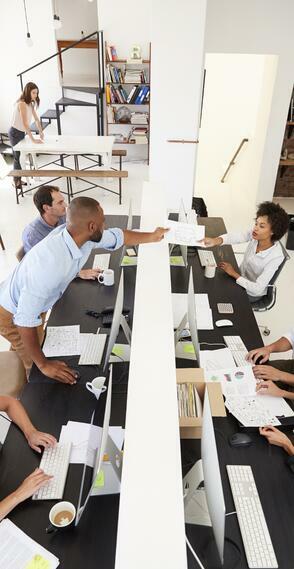 Positive workplace culture is essential in mitigating disputes and can be achieved in a number of ways. Allowing your team to seek professional development opportunities is a great way to create a work environment of growth and continued learning. 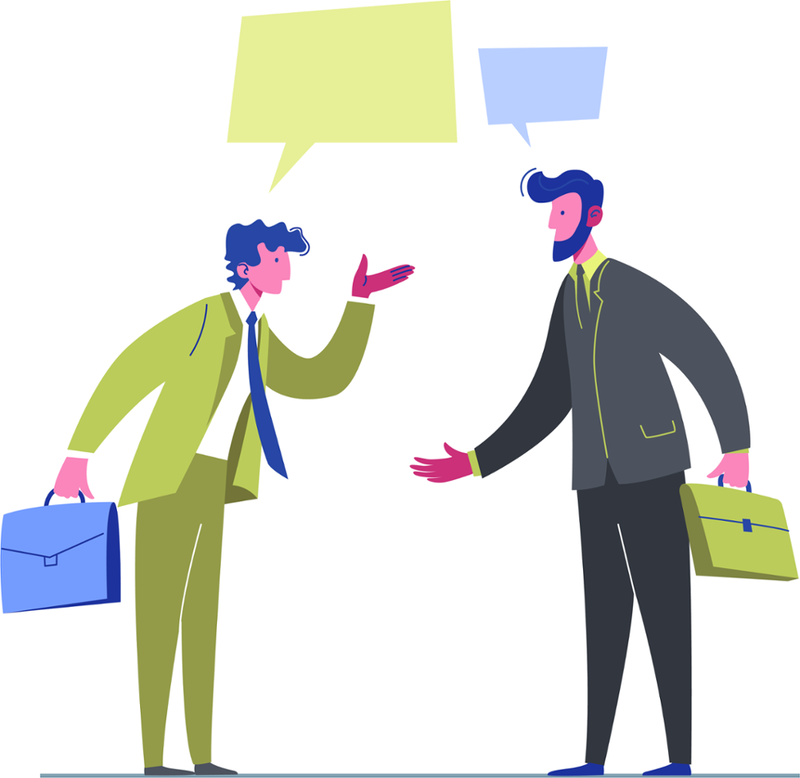 One strategy that many organizations leverage to prevent issues between teams is encouraging communication across groups of employees who may not work with each other on a daily basis. By improving cross-team relations, the chances of future personality clashes are reduced. 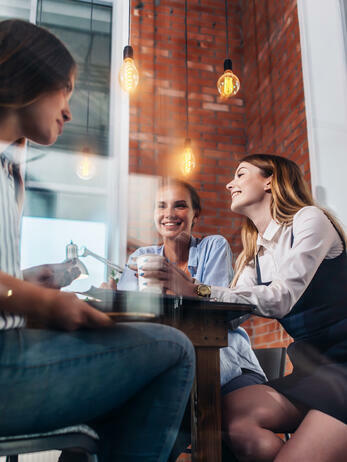 When employees are more familiar with one another on a personal level, they become more sympathetic to situations that may otherwise cause them to start a conflict. Schedule team lunches where different departments can come together and interact in a neutral setting. There’s a good chance that this will lead to stronger relationships between employees and create a reduction in workplace conflicts. The single most impactful thing you can do as a manager during conflict resolution is to turn it into a learning experience for the parties involved. Any form of raw, emotional conversation is an opportunity to gain insight into perspectives you may not have previously considered. Always remember that conflict is a fact of life, and it’s not the end of the world when one arises. By standardizing the way you resolve disputes and using them as learning opportunities, you can turn workplace conflict resolution into a competitive advantage. Become an expert on handling these hard-to-deal-with leadership tasks by leveraging a management training program that’s right for you. Your personal development is just as important as that of your team members. Remember: great things can come from conflict. When issues in the workplace arise, address them not as inconveniences, but opportunities for growth. This outlook will prevent rippling disputes from occurring after the fact, and your whole team will improve because of your thoughtful process of helping them get past their conflicts.